Quark-gluon plasma is formed as a result of high energy collisions of heavy ions. After a collision, for a dozen or so yoctoseconds (that's 10-24 seconds! ), this most perfect of all known fluids undergoes rapid hydrodynamic expansion with velocities close to the velocity of light. An international team of scientists, associated with the IFJ PAN and the GSI Centre, has presented a new model describing these extreme flows. Interestingly, for the first time effects resulting from the fact that the particles creating the plasma carry spin, that is, quantum rotation, are taken into account. Each proton and each neutron is composed of several quarks bound by strong interactions carried by intermediary particles called gluons. When heavy ions built of protons and neutrons, accelerated to velocites very close to the velocity of light, collide with each other, they usually undergo destruction, transforming into an exotic fluid: quark-gluon plasma. Due to its negligible viscosity, this plasma is considered to be the most perfect fluid in the Universe. New experimental measurements, however, suggest that the particles leaving the plasma exhibit nontrivial arrangement of their spin directions. In order to explain these results, a group of scientists from the Institute of Nuclear Physics of the Polish Academy of Sciences (IFJ PAN) in Cracow and the GSI Helmholtz Centre for Heavy Ion Research in Darmstadt (Germany) has presented a new model of relativistic flows of quark-gluon plasma, taking into account the phenomena arising from the quantum spin of the particles forming it. For about ten microseconds after the Big Bang, quark-gluon plasma filled the entire Universe. However, it rapidly cooled down and gluons stuck the quarks together into groups - the particles of which our world is built. As a result, quark-gluon fluid can today only be seen as the effect of high-energy collisions of heavy ions (and, possibly, also of smaller colliding systems consisting of protons and ions). Collisions of this type are currently being carried out in just a few accelerator centres in the world. The flow of fluids and gases is dealt with in hydrodynamics, a field that has been under development for centuries. After the emergence of the theory of relativity, classical hydrodynamics was extended by relativistic phenomena, occurring when fluid flows at velocities close to the velocity of light. After the birth of quantum theory, with time, hydrodynamics can be extended by descriptions of the flow of particles with spin. Spin is a feature of elementary particles associated with the properties of their wave functions relative to rotation. It can only take on discrete values, e.g. 0, 1/2, 1, 3/2, etc. The direction of spin of particles with spin 1/2 can be equal to +1/2 or -1/2 with respect to any axis. The non-zero polarization of particles with spin 1/2 means that the produced particles are more likely to take on one spin direction (+1/2 or -1/2). "Hydrodynamics is an excellent tool for describing many physical phenomena. We have broadened its scope of applicability. 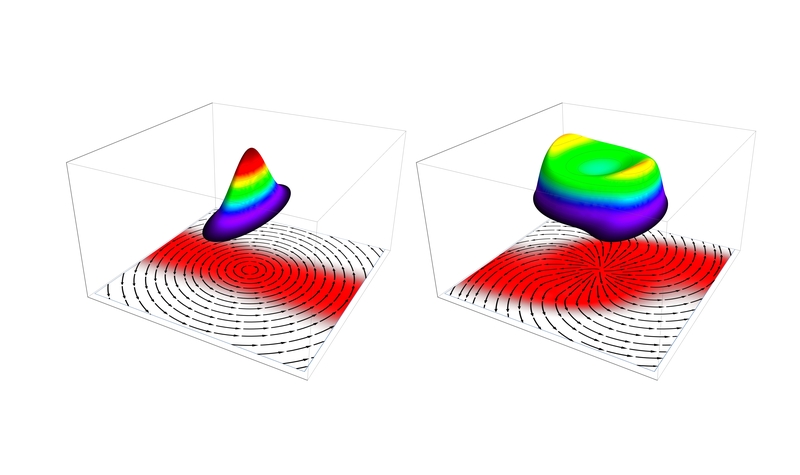 We are the first to present a coherent description of relativistic particle flows with spin 1/2," explains Prof. Wojciech Florkowski (IFJ PAN, UJK, EMMI), who in collaboration with the group of Prof. Bengt Friman (GSI) has developed a new flow model. Work on the model of relativistic flows with spin was inspired by recent measurements of the polarization of spins of particles known as Lambda hyperons (these are conglomerates of three quarks: up, down and strange, with a total spin of 1/2), recorded in heavy-ion collisions. Physicists have long been experimenting in trying to better understand the polarization of Lambda hyperons. The measurements, however, were subject to considerable uncertainty. Only recently in experiments carried out at the Brookhaven National Laboratory on Long Island near New York has it been shown that the spins of the Lambda hyperons formed in collisions of heavy nuclei are indeed polarized. It has been known for a long time that the spin of a quantum object contributes to its total momentum. For example, in ferromagnetic materials, the Einstein-de Haas effect can be observed: when a non-polarized system is placed in a magnetic field, the spin of the particles it is composed of starts to orientate according to the magnetic field which means that to maintain the total angular momentum the system must begin to rotate. Observation of the polarization of the Lambda hyperons formed as a result of quark-gluon plasma transformations thus indicates the difficult to ignore role of spin in shaping the flow of this plasma. The model presented by the group of physicists from IFJ PAN and GSI is a generalization of the hydrodynamics of perfect fluid. Since there is spin in the described systems, the principle of angular-momentum conservation should have been included in the theoretical description. "Just as temperature is associated with the principle of conservation of energy, velocity with the principle of conservation of momentum, and electric potential with the principle of conservation of charge current, so in the systems described by us, spin polarization is associated with the principle of conservation of momentum. When you take this principle into account, you get additional equations, better describing the evolution of the system," explains Prof. Florkowski. Quark-gluon plasma is such an exotic state of matter that for decades or even hundreds of years there will be no question of its technological applications. However, these studies have important implications today. Relativistic flows of particles with spin are in fact a new window to the world of strong interactions, which, among others, bind quarks in protons and neutrons. Thus, strong interactions play a very important role in the Universe, but they are extremely complicated to describe. Therefore, researchers hope that in relativistic flows with spin it will be possible to get to know these effects a little better. This study was co-funded, among others, by the ExtreMe Matter Institute (EMMI), which operates at the GSI Helmholtz Centre for Heavy Ion Research in Darmstadt (Germany). "Relativistic fluid dynamics with spin"
Ultrarelativistic flow of quark-gluon plasma with spin. On the left, the initial state of the system, on the right - the result of hydrodynamic evolution. Prof. Wojciech Florkowski | EurekAlert!